Doctor, Doctor!" 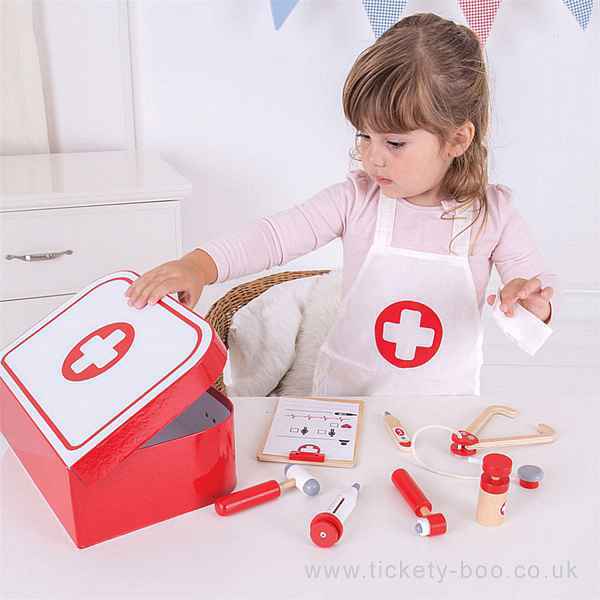 This beautifully crafted wooden Doctor's Kit has everything a young doctor needs to nurse sick teddies or poorly dolls back to health. Children can listen to their patient's heart using the stethoscope, check their temperature with the thermometer and even take a look in their ears with the otoscope. This 10 piece pretend play set features a medicine cream bottle, reflex hammer, otoscope, thermometer, syringe, stethoscope, clipboard with paper, apron and bandage, all supplied in a colourful carry case with handle. 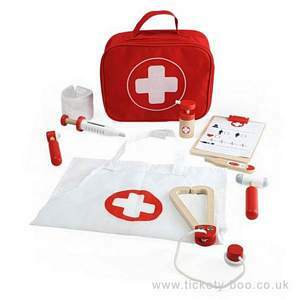 A great way to encourage creative and imaginative role play sessions and help children understand the process of going to see the Doctor. The handy carry case makes this Doctor's Kit a great travel companion. Made from high quality, responsibly sourced materials.